To say that Ellen MacArthur is a phenomenal woman is an understatement. In 2005, aged 28, she became the fastest person to sail solo, non-stop around the world. It took her 71 days, 14 hours and 18 minutes. You’re going to hear what that was like, how she stayed focused and what she learned from it. The importance of goal setting really comes through in this interview. Ellen is obviously an incredibly determined person but there’s a take-away for us all here: it’s about having a plan - knowing which direction you want to go in is how you make stuff happen. WHAT’S ALL THIS GOT TO DO WITH FASHION? This is the story of how a world-record-breaking British sailor became an international advocate for the circular economy. How she created a platform, the Ellen MacArthur Foundation, to encourage the global economy to transition to a system that designs out waste & pollution, keeps materials in use and regenerates natural systems. It's also the story of what that might look like, and how we can action it. Ellen’s lightbulb moment happened at sea. In parts of the Southern Ocean she was 3000 kilometres from land. If she ran out of teabags, there was no nipping to the shop to buy more. She wrote in her logs: "What I have on this boat is all I have.’” That’s how it is with the Earth’s finite resources too. 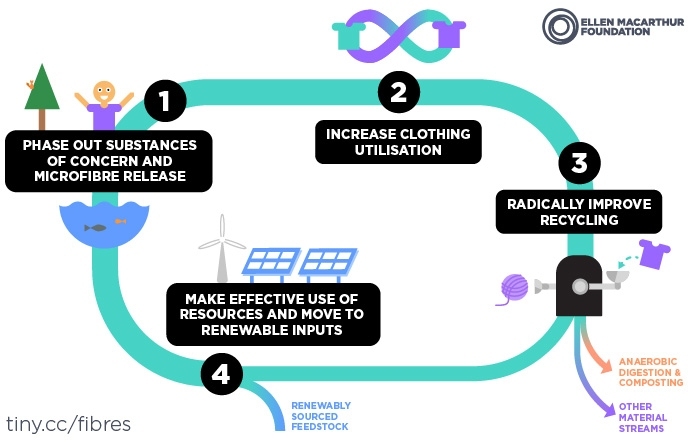 Last year, the Ellen MacArthur Foundation launched its Make Fashion Circular initiative at the Copenhagen Fashion Summit with Stella McCartney and a bunch of other big brands on board. The aim is to tackling fashion’s polluting and wasteful ways and create a new system. Ellen is a Dame Commander of the British Empire, a Business of Fashion 500 member, and has spoken at the World Economic Forum’s Annual Meeting in Davos. She’s also founder of a founder of the Ellen MacArthur Cancer Trust, a charity which takes young people sailing to help them regain their confidence on their way to recovery from cancer, leukaemia and other serious illnesses. Ellen retired from competitive sailing in 2009. GIVING IT UP. BUT NOT GIVING UP. This is from a 2010 profile piece from the Telegraph UK, by Elizabeth Grice: “Nothing mattered more to Ellen MacArthur than the sea, unless it was being the fastest person on its surface. It was her element, the great obsession from childhood. With the boats that took her round the world, she had a kind of symbiotic union. They worked as one. And when she was back on land, everyday life felt trivial, people pressed in too much, and she soon wanted to be out on the ocean again, testing herself against the elements even in places that had nearly destroyed her.” And yet in 2009 she announced her retirement from competitive racing, in order to focus on her work in the circular economy. She officially launched the ELLEN MACARTHUR FOUNDATION in 2010, having spent several years studying up, speaking to every business leader and economist who’d lend her some time. The foundation works to inspire a generation to re-think, re-design and build a positive future circular economy. READ. Ellen’s autobiography Full Circle was first published in 2010. It’s un-put-downable. Buy it here. The ELLEN MACARTHUR FOUNDATION works on a strategic level with influential businesses across key sectors of the economy to demonstrate circular innovation at scale. These Global Partners are pathfinders within their respective industries, exploring the potential of the circular economy as a source of value creation. MAKING FASHION CIRCULAR. Less than 1% of material used to produce clothing is currently recycled into new clothing. Meanwhile global clothing production pretty much doubled between 2000 and 2015. Another must-read Ellen MacArthur Foundation report is The New Plastics Economy. With 8 million tonnes of plastic entering the ocean each year, we urgently need to rethink the way we make, use and reuse plastics. YCLOSET is a Chinese “virtual closet” service that, for around $80 a month, allows subscribers unlimited access to clothes for rent. GLAMCORNER is Australia’s answer to Rent the Runway. They’re also a B Corp. Find out more here. PATAGONIA pioneering free repairs both in store and on the road via its Worn Wear program. Have you listened to the podcast with Patagonia’s director of philosophy, Vincent Stanley yet?